On its web page, Seventy Thirty claims it offers “crème de la crème” matches. Tereza Burki, 47, was awarded a £13,000 ($A23,000) payout after an "exclusive" dating agency failed to find the "man of my dreams, the father of my child", The Sun reports. The mother of three forked out £12,600 ($A22,000) for Seventy Thirty Ltd's services. She told the High Court the agency had told her it only dealt in "crème de la crème" matches and could introduce her to "bachelors you dream of meeting". Judge Richard Parkes QC yesterday ordered the agency to repay Ms Burki's fee - saying she had been "deceived" by Seventy Thirty's then-managing director. He told the court: "Gertrude Stein quipped that whoever said money can't buy happiness didn't know where to shop. Tereza Burki successfully sued a dating agency after it failed to find her love. Picture: Tereza Burki/Facebook. This case is about a woman looking for romantic happiness who says she was tricked into shopping in the wrong place, paying a large sum to a dating which, she says, made promises but failed to produce the goods." The court was told Tereza signed up for the dating agency in 2014 looking for a wealthy man with "a lifestyle similar or more affluent than her own". The mum-of-three also wanted her new boyfriend to have "multiple residences" and be willing to provide her with another child. Tereza, who lives in plush Lennox Gardens, Chelsea, said she "felt very let down and disappointed" that the agency's claims were "untrue". Giving evidence, she said: "You shouldn't promise people who are in a fragile state of mind, in their mid-40s, the man of their dreams. As well as giving her money back, the judge awarded her £500 ($A876) for the "disappointment and sadness" she suffered - bringing her total payout to £13,100 ($A22,955). But the mum was ordered to pay Seventy Thirty £5,000 ($A8761) in libel damages after writing a damning Google review of the agency where she branded it a "scam". 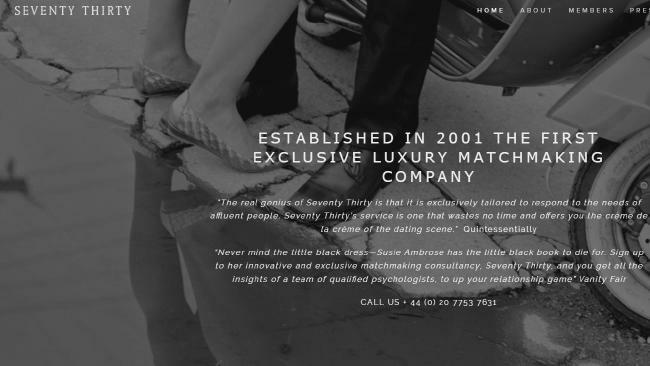 Seventy Thirty Ltd said: "Ms. Burki entered into membership with the wrong assumption about the number of potential gentlemen we would introduce her to. "She assumed it would be like internet dating, but we are a niche, exclusive agency, not a mainstream, mass-market online dating service. We are not going to have thousands of members because there simply aren't thousands of single, wealthy, high-calibre prospects out there."